Netflix and Microsoft are joining forces to celebrate the new season of Arrested Development. Welcome to the brave, new world. A decade ago, when a TV show was canceled, that was it. Maybe you'd see a DVD release or a latter-day film adaptation, but the odds of the series being resurrected were somewhere below slim-to-none. 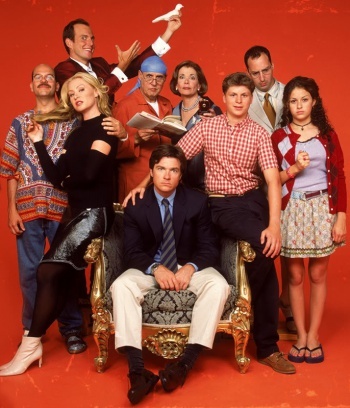 In 2013 however, we're all about experimental media expansion, and as such streaming video service Netflix has ponied up the cash to fund a brand new season of cult hit comedy Arrested Development. This new seasons makes its debut on Sunday, May 26 and to celebrate the occasion, Microsoft is offering Netflix subscribers a free weekend of Xbox Live. If that seems like an odd tie-in, you're missing the crux of this promo: By giving Netflix subscribers free access to Xbox Live, Microsoft is also offering a free trial of the Xbox 360's Netflix application. Granted, the Xbox 360 app isn't as full-featured as Netflix's browser-based incarnation, but given the media centers Microsoft's console is most often connected to, the Xbox 360 Netflix app can generally provide a more comfortable, intuitive viewing experience than pulling up a TV series on your laptop, iPhone or especially fancy toaster oven. As for how you can get in on this deal, that's very simple: If you're a Netflix subscriber who owns an Xbox 360, you're already in. Simply fire up your console, log onto your Xbox Live account, and if it's one of the subscription-free Silver accounts you'll find that you've automatically been upgraded to Gold for the duration of the weekend. Caveats? None, as far as we can see. Obviously the trial will end at some point, cutting off your Xbox Live Gold access, but a free weekend of service is a nice bonus, particularly for those with extant Netflix subscriptions. If you're one of those people who prefers to maintain a subscription to whichever cable provider has a vague monopoly in your area, yet still find yourself attracted by the idea of new Arrested Development episodes, you can sign up for a Netflix account on the firm's site. It will set you back $8 per month, but the first 30 days are gratis (and will still qualify you for the free Xbox Live Gold weekend).